I'd like to give a big thank you to Joe for running his great WWII East Front scenario for us last month. 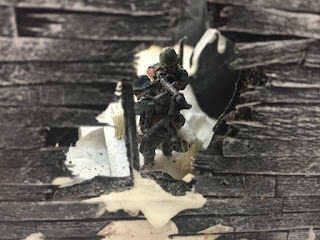 For those of you who didn't make the game here's a quick AAR with photos. There were many twists and turns in this game, mostly due to the special event cards that Joe had prepared and the hero factor that can occur during morale rolls. 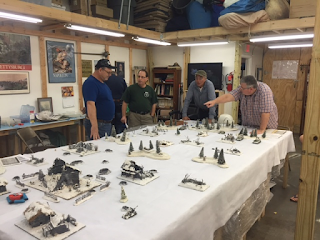 The game was played on 21 November 2015 at 1000 hrs at the official SMG club house "Das Kreig Haus" in Fort Lauderdale. 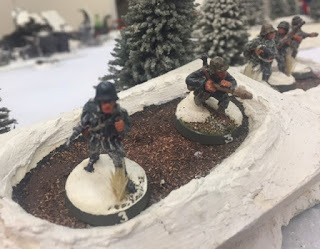 Joe Guilbert ran a 25/28mm WWII East Front 1944 game using the Battleground WWII rules. He has an awesome and extensive WWII 25/28mm collection! Narva, March 17 1944. The Soviet 930th Regt , the 46th Guards Heavy Tank , and 1902 Self Propelled Artillery launch an attack near Auvere Station. Remnants of the 162nd Regt are overrun. 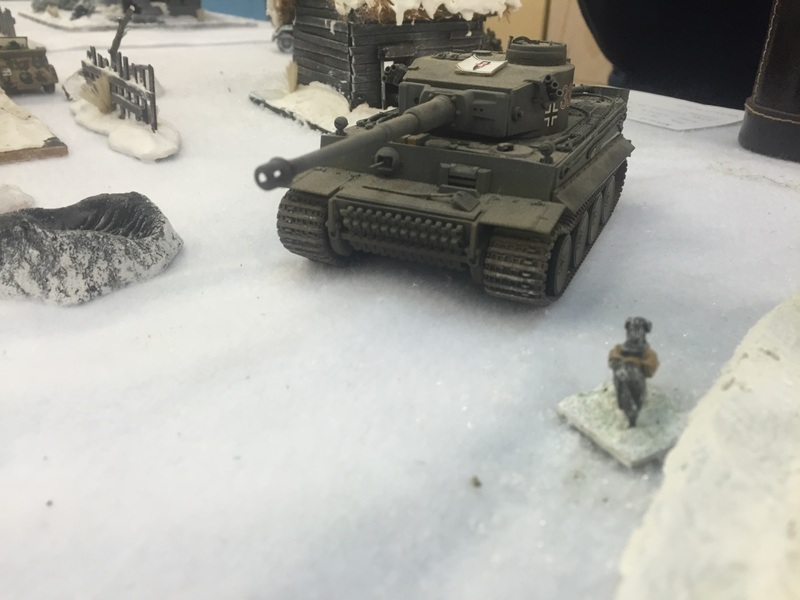 Can Otto Carius and his Tiger save the 61st Div HQ? 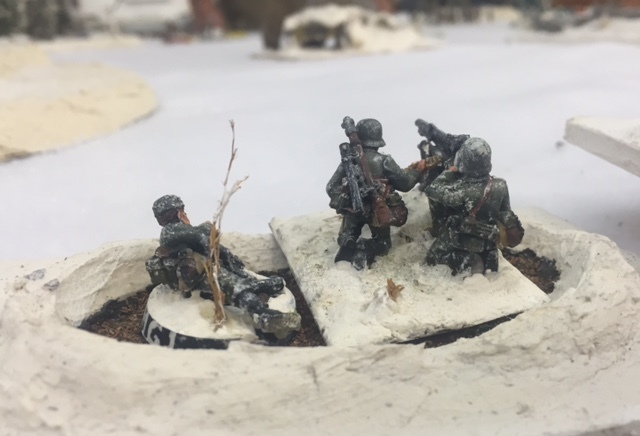 The remnants of a German infantry platoon have prepared defensive positions in order to stop the Soviet armored advance thus attempting to protect the 61st Div HQ troops. The Soviet forces entered on the left base line anywhere they desired. 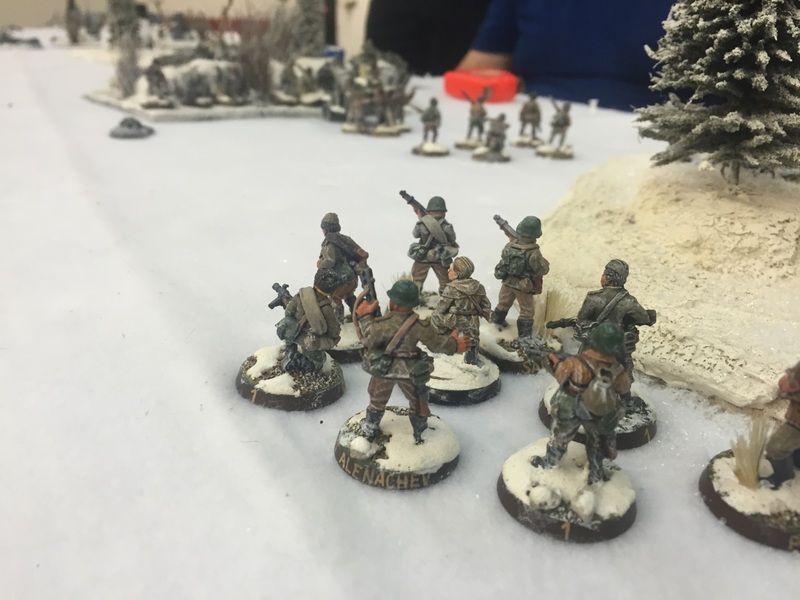 The Germans started the game hidden and in prepared positions starting anywhere they desired to the right of the center line of the table. 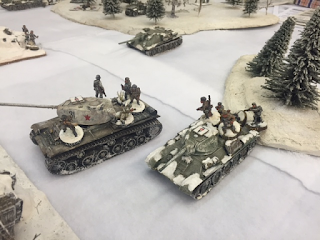 The Russian armored forces advance with tank borne infantry. The Germans nervously await the Soviet onslaught hidden in their foxholes and hasty positions. The Soviet commanders discuss their strategy as their troops cautiously advance. 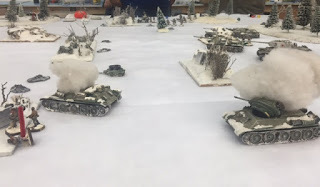 The Russian tanks continue to advance, still no signs of their enemies as they leap frogged from terrain feature to terrain feature making the most of the limited cover of this battlefield. The whistle of incoming shells can be heard. The Soviet infantry on the left flank come under intense artillery fire. Luckily for the massed Russian infantry the German gunners were off target (poor dice rolls) and very few casualties were incurred. The next turn saw the Russian infantry spread out to protect themselves as they continued to advance along the same axis. The Soviet tanks halt and return fire attempting to suppress the FO and to reduce the German positions on the German right flank! The now spread out Soviet infantry on the German’s left came under enfilade fire from an entrenched German HMG hidden on the wooded rise. 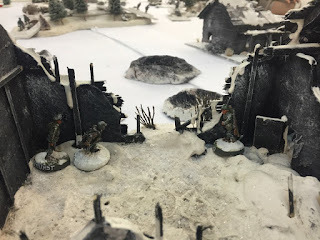 At the same time the German squad hidden inside the ruined farm house in front of the advancing Soviet platoon opened up in conjunction with some fairly effective off board German arty causing a lot of casualties and moral check for 2 Soviet squads. Enfilade fire provided by an MG 34 position. The center and right flank were still quite, only the German FO was spotted and then targeted. As the Soviet tanks neared a damaged dwelling on the German far right a squad of hidden Germans opened up on a T34 and their tank riders. A lucky shot from a panzerfaust ricocheted off the hard packed snow penetrating the thinner underbelly of the Russian tank destroying it and killing the crew. 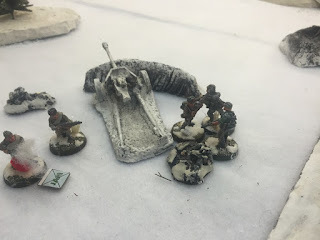 The squad’s small arms fire also took a heavy toll on the supporting infantry. 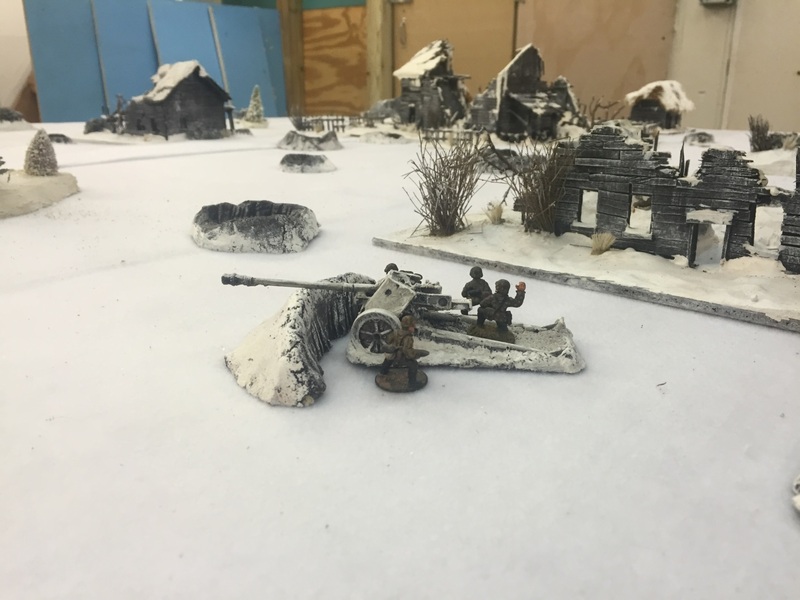 During the next turn the Russian left halted to attempt to reduce the German fighting positions and kill the inhabitants. 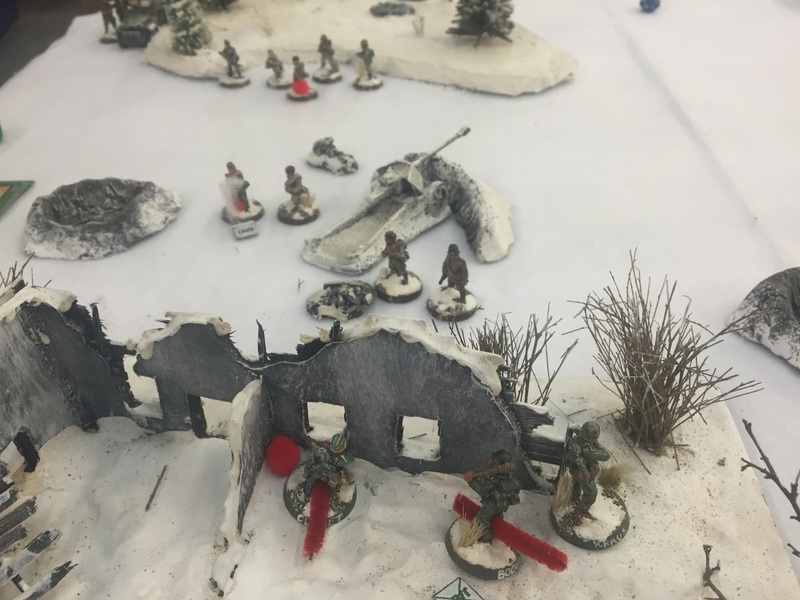 Whilst the Russian right flank halted to clear out the enemy positions an event card was pulled which brought the Soviets some much needed air cover. 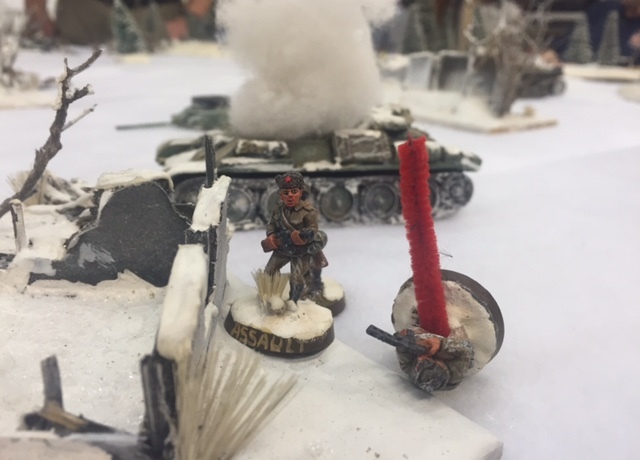 Unfortunately due to the smoke, haze, and the confusion of battle, the Soviet ground attack aircraft bombed and destroyed a second Russian T34 with catastrophic results (a lucky die roll) which also killed the squad of tank borne infantry. All looked lost for the Soviets at this point save for the progress that the leg infantry was making on the German left flank. 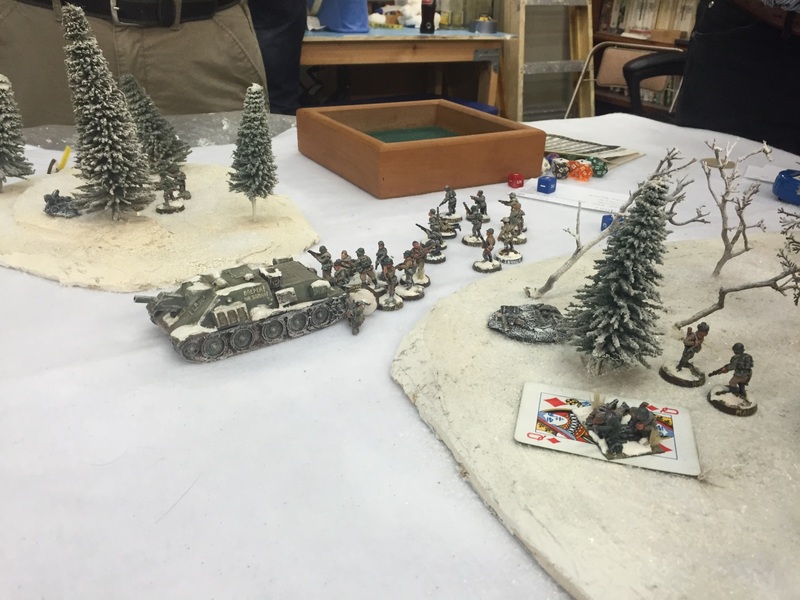 Several Germans became heroes due to very lucky morale rolls of a 20 on a D20 which stiffened up that flank. The Soviets never had a chance to bring their two Maxim HMG’s into action to support their infantry advance as the hidden German sniper kept hitting and wounding the HMG crew members which caused morale rolls and suppressions for the crews each time. 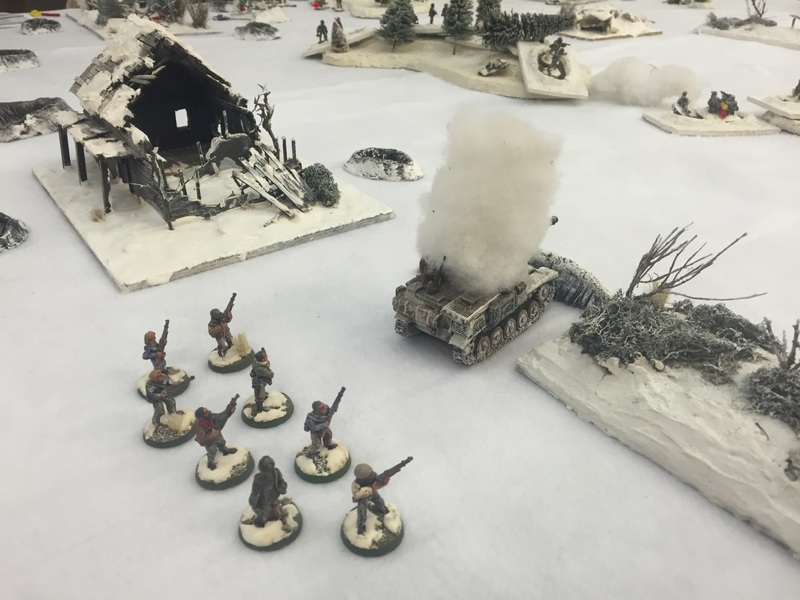 A hidden and emplaced German PAK 40 A/T gun opened up on the advancing armor causing minor damage and morale checks to the Soviet forces in the center of the table. The Soviets quickly located and eliminated the gun and crew with accurate motor and direct HE fire from the supporting AFV’s. After further small arms exchanges some Soviet infantrymen also became heroes despite heavy loses. 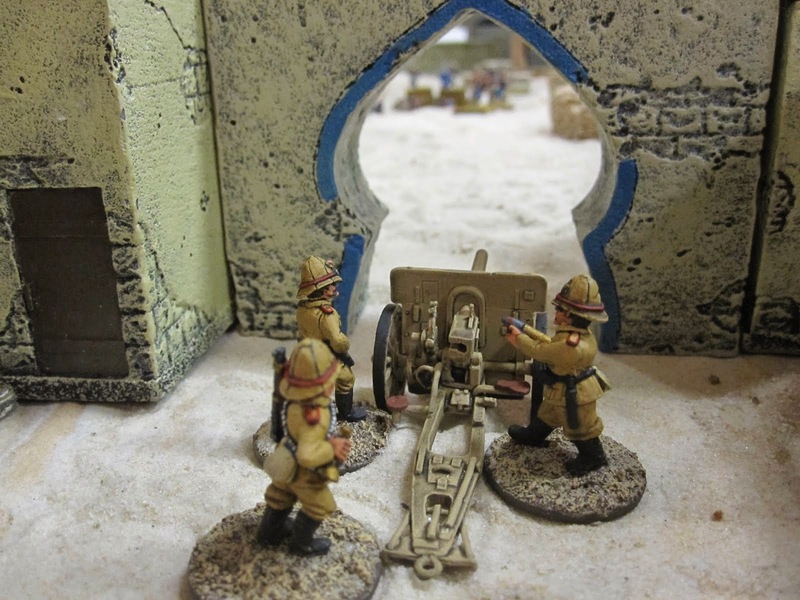 The ensuing heroes charged each other in a deadly melee fighting over the dead bodies of the PAK 40 and HMG crews. 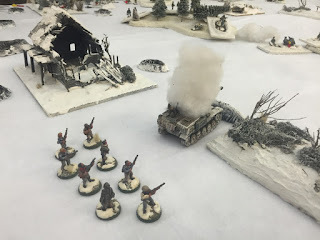 The combined fire of the Soviet mortars, AFV’s and superior numbers of infantry (along with better dice rolls) finally took its toll and the German left collapses with the loss of a PAK40 AT Gun and crew, an MG 34 gun and crew, and the entire German left flank squad. Close combat! 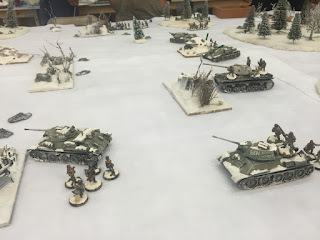 The Germans and Russian heroes charge each other! 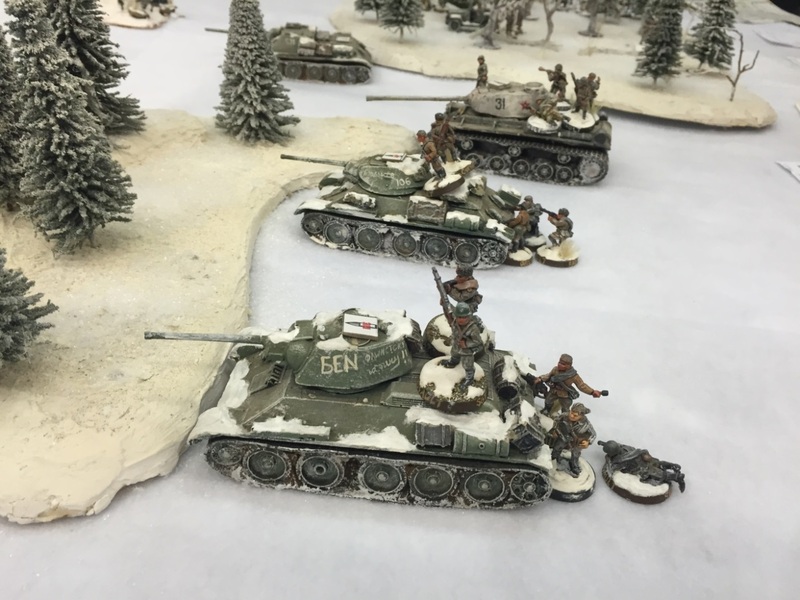 While this was occurring a Soviet Partisan unit infiltrated through the HQ positions, sneaking by the HQ security squad and LMG team and crept up to the open topped Marder tank destroyer. Due to multiple poor German spotting dice rolls from the both the HQ squad and Marder crew the Partisans snuck up to within throwing distance of the vehicle and managed to throw Molotov cocktails into the open top, cooking the crew and destroying the vehicle! Partisans destroy the Marder tank destroyer with a Molotov Cocktail and Small Arms fire! What looked like an imminent German victory now seemed to be a Soviet success. Luckily for the Germans it was time for the arrival of Oberleutnant Otto Carius and his Tiger along with a German panzergrenadier squad mounted in a 251 halftrack. Oberleutnant Carius made quick work of a Soviet AFV while the Soviet return fire was ineffective. It appeared once again that the Germans had stopped the Soviet advance and that the Regimental HQ troops behind this last ditch position would be saved. But wait, yet another event card was pulled and this time it actually helped the Russians. A dog mounted A/T mine crew was added to the Soviet arsenal and was placed with the left flank Soviet forces that were rapidly advancing to the German rear. Next came the deadly dance between dog and Tiger. Back and forth they moved, each trying to out maneuver the other. Oberleutnant Otto Carius had met his match. He easily dispatched enemy AFV’s but he could not defeat the dog. The Soviet A/T mine dog took MG fire from Oberleutnant Carius’ Tiger and evaporated in the resulting inferno that erupted from the charge he carried. Unfortunately the explosion also blew off the main sprocket wheel for the Tiger leaving it a stationary yet very deadly immobile pillbox. 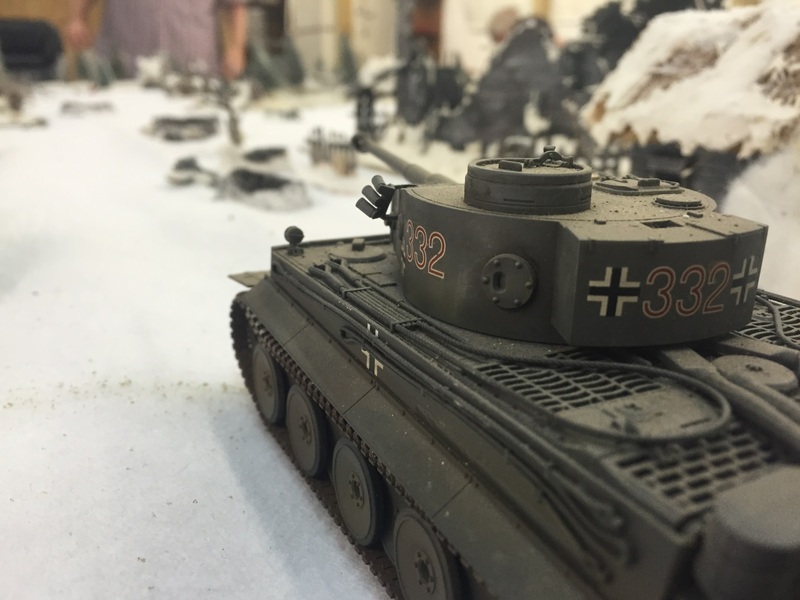 With the arrival of the German reinforcements and the destruction of several Soviet AFV’s it was deemed a draw. The Soviets had infiltrated some infantry around the left flank but nothing significant enough to truly threaten the Regt HQ troops without armor support. The Germans still held the center and right of the table with overwhelming infantry forces with hand held A/T capability which combined with Oberleutnant Carius’ Tiger bill box of death had stalled the remaining Soviet armor advance. A German LMG team covering the HQ position and the rear of the Marder. Due to poor dice rolls they saw nothing! scenario in the near future!!! !